I've owned this unit for more than 15 years now and I recall I purchased it on sale at Sears for $999 when the MSRP was a $1800 on the same day I bought a Panasonic Digital Camcorder. The camcorder still works but it's old technology and my Samsung smartphone has higher resolution now anyways. But back to the JVC TH-A10... it still sounds like the day I got it home. A true 100W system which sounds better than those ads we've all seen with systems claiming 500 to 1000+ watts. I've practically use it everyday for the past 15+ years and still no problems so that one guy who claimed he's owned 5 of them and they keep breaking on him sounds like bull crap to me because if it were so crappy as he claimed, why keep buying it over and over again? Also since Blu-Ray has come out I use the highly adaptable and a multitude of inputs to input an external Blu-Ray player through it's AUX connection which still gives me the ear shattering and heart thumbing bass only a certified Dolby SRS system can bring. With still more connections to keep adding more components. That one scene in Jurassic park where the ground shakes while we view the water in it's foot print .... ... the bass of the sound has a way of shaking us to the bone in an eerie manner. To this day I have yet to crank the volume level past 56 because for fear my neighbours would be breaking down my door. At 56 the wine glasses begin to vibrate against each other and I can feel the rumbling of the bass in the walls and floors of my condo unit. I just got from someone the TH-A10R surround systems without DVD player , can I use another DVD player to match with it? It seems it require special cable which connects only to jvc DVD player . My current players not compatible. probably one of my best investments. i love this product but know it will 't power on and can not find a repair shop to fix it. It breaks with 5 of 5 units being bad over a time span of about 2 years. I have gone through 5 of these units. Each one lasts about 4 months before a problem develops, but the last unit lasted only 3 weeks. Unit 1: The DVD wouldn't spin anymore. Unit 2: The DVD drawer wouldn't open any more. Unit 3: The audio quit, first when I installed a DVD, then later, with all audio sources. Unit 4: The unit would not power up. Unit 5: Long hang time in powering off, up to 2 minutes after I hit the off on the remote. Each time I got a replacement for the entire package, not just the main unit. Each time I thought it would function, no problem and each time I was dissapointed at the most inconvienant time possible. I believe the main problem is that the unit runs too hot. I put mine on top of the funiture that holds my I'Art JVC T.V. so it has a thick piece of wood seperating it from the heat generated by the television. I also don't put anything above or on top of it. Still, every one of them got quite warm to the touch on their top. No vents, no fan. When the unit functioned it sounds and plays awesome!!! Nothing finer out there for the day-to-day use and if you use the compulink feature, it's even better. I have the T.V, VCR and CD changer all JVC and compulinked up. So easy to record or play any of the media. But alas, I am tired of boxing it up and shipping back. It's just not worth it. I hope someone out there could suggest a reliable replacement for this thing, I really like the small footprint it uses in my small house. simple installation, user friendly, high sound quality. size of the sub, connector from sub to the unit is to short. Blue lights on dvd unit are to bright. When shopping for this unit I was taken by the ammout of similer products in its field. I tested over 15 similar units before concluding that the JVC was the product for me. Although, all the products had their special features the JVC seemed to have the most. 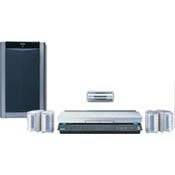 I was interested in having unobtrusive speakers, and the JVC's sleak satin silver speakers looked great. I was interested in Strong base and decent volume levels and the JVC also was much stronger than the compition. For the money I don't think that I could have done much better, unless I went with seperates, which would have taken me to a new price field, altogether. Sleek "B&O" style but at an affordable price. Strong chasis, built-to-last feel. Speaker's mids & highs sounded harsh, no depth. Subwoofer weighs a ton. Controls are a bit confusion to use in the beginning. Finally, after 3 weeks of wait, I received my THA10 yesterday. It came in a huge, over-sized box not one man can carry. Excited, I quickly unboxed it and took everything out of the box. I bought this item JVC factory refurbished because I couldn't spend the $1700 MSRP price (If I had that kind of money, I would just add a little more and get the Bose or Nakamichi). So I paid $489 for a reconditioned one. Surprising enough, after a million layers of packaging plastics, I dug out the unit, it was a joy to my eyes. Although reconditioned, the unit, speakers, sub all appear in brand new condition without any hint of prior usage. The unit itself was a beautiful, with its sleek brushed aluminum casing. Speakers felt "weighted" and well built (although assembled in China, headunit was made in Japan). Subwoofer was HEAVY. Anyways, after hooking everythign up, I must admit I was a bit disappointed. While playing Matrix, the highs were a bit harsh, I tried different positionings all returned the same result. Sub was powerful enough for my living room, however, I still have to locate a perfect place to set it. This is for now, I left the system on all night, and today to warm it up to see if it'll sound any different tonight. Will update later. Great sound, lots of inputs/outputs for mini system, good bass sound. This mini system produces far more sound than I expected when I purchased it. Originally I was worried because I was going to use this system in a large room with a high ceiling, but the sound that those little 20 watt speakers produce is large enough to fill any room. The system plays DVDs with DTS and Dolby Digital sound flawlessly, and produces great Pro Logic sound when used with a VCR and/or TV. I have another audio system that is made of Pioneer components and is supposed to be much better than the little JVC, but the JVC can compete with it any day. My only regret is that the system simply does not play CD-Rs. Highly recommended as secondary, or even primary system. I think the value or the system is great if you can get it for under $1400, which is not hard to do. The 20 % of the company specifications are not suit with the actual product.